This is a very nice verse composed by Rūpa Gosvāmī, that one friend of one gopī, she is warning, "My dear friend, please do not go that side." "Where?" "In the keśi-tīrthopakaṇṭhe, on the bank of Keśī-ghāṭa, Yamunā." "Why you are warning me?" "Because there is that boy whose name is Govinda." "What He is doing?" "He is simply smiling, and with His flute, and He is so bright by the rays of the moon that He looks very, very beautiful." "Then? What happens?" "Now, if you go and see Him, then you will forget your engagement with family and friendship and love and everything. Oh. He will absorb everything. So don't go there." She is warning, "Don't go." In other words, Kṛṣṇa is so attractive by His activities, transcendental activities, by His beauty, by His opulence, by His strength, everything... If you read the history of Kṛṣṇa's activities in the Śrīmad-Bhāgavatam or in the Bhagavad-gītā, they are so attractive that one automatically becomes attracted and he forgets all other attraction. This is natural. This is not an artificial. Kṛṣṇa consciousness is so nice that once situated in Kṛṣṇa consciousness, you will forget all nonsense of this material life. So this movement is simply to revive that dormant consciousness. Nothing artificial. And by the grace of Lord Caitanya, it has been made very simple. Simply chant Hare Kṛṣṇa and dance. That's all. You haven't got to be very highly educated in the university. You haven't got to exercise in so many yogic process, sitting posture, or hard press your nose, or you keep your head down. Nothing. No labor. Simply come here, chant Hare Kṛṣṇa and take Kṛṣṇa prasādam. This very simple method will revive your Kṛṣṇa consciousness. You know, all, that two years ago in 1966 I started this class alone. I was chanting only. That's all. That was my whatever you call. And these boys and girls, gradually they came, and they became attracted. I did not teach them any artificial method of yoga practice, but simply I requested them, "You chant and hear." So very easy process. You can revive your dormant Kṛṣṇa consciousness simply śravaṇādi śuddha-citte karaya udaya. The process is that as you go on chanting, then all the dirty things within your heart will be cleansed. Simply we want to cleanse. Caitanya Mahāprabhu has recommended this chanting, and He has said that the result of chanting will be, the first installment of your gain will be, that your heart will be cleansed. The first thing, which is being tried by the so many mental speculators, how to cleanse the heart, that will be achieved in the first installment by simply chanting Hare Kṛṣṇa. Ceto-darpaṇa-mārjanaṁ bhava-mahādāvāgni-nirvāpanaṁ (CC Antya 20.12). And as the cleansing process of your heart makes progress, then you become freed from the blazing fire of material existence. Ceto-darpaṇa-mārjanaṁ bhava-mahādāvāgni-nirvāpanaṁ śreyaḥ-kairava-candrikā-vitaraṇaṁ. And then again, just like in the moonlight, daily, the moon increases the light. When the moon is rising daily in the bright fortnight, daily you see that the moon is increasing in shape. So this, that very example, is said here also. As soon as your heart is clean and you immediately you become freed from all material contaminations, then your real pleasure on the platform of Kṛṣṇa consciousness increases in the proportion. As the moon increases in the sky daily, and as one day it becomes the full moon, so this process is so nice that increasing daily by chanting, one day it will come that you will simply love Kṛṣṇa and forget everything. Ceto-darpaṇa-mārjanaṁ bhava-mahādāvāgni-nirvāpanaṁ śreyaḥ-kairava-candrikā-vitaraṇaṁ vidyā-vadhū-jīvanam (CC. Antya 20.12). And so far knowledge is concerned, you will get it automatically. You will get all knowledge. Our material conditional life is simply due to ignorance, and when you come to Kṛṣṇa consciousness, the full moonlight of Kṛṣṇa consciousness, all knowledge, will be at your feet. Everything you will know. Vidyā-vadhū-jīvanam. And ānandāmbudhi-vaṛdhanaṁ: then you increase the ocean of transcendental bliss. The ocean. The ocean never increases, but the transcendental ocean of bliss increasing daily, daily, and you enjoy it. Ānandāmbudhi-vaṛdhanaṁ sarvātma-snapanaṁ. Sarvātma-snapanaṁ. Just like when you take your shower bath or a dip into the ocean, you feel fully comfortable, similarly, by taking your dip into the ocean of bliss of Kṛṣṇa consciousness, you will feel fully refreshed, fully refreshed, without any doubt. Paraṁ vijayate śri-kṛṣṇa-saṅkīrtanam. Therefore Lord Caitanya gives, "All glories to the saṅkīrtana movement, Hare Kṛṣṇa." So this is the process. God is not dead. God cannot be dead. This is all foolishness. God is there. How you can conceive, how you can perceive that God is not dead? There is sufficient symptom that God is not dead. Just like your body. If you are breathing, if your bodily functions are working nice, if there is blood, and if you are feeling, thinking, willing nicely, will the doctor say that you are dead? No. He will say, "No. All the symptoms of life are present there, so he is not dead. He is alive." Similarly, if you have got that talent to test how God is alive, that is very simple. The whole cosmic manifestation, the whole gigantic body of God is working so nicely. The sun is rising in time, the moon is rising in time, the seasonal changes are taking place in time, the planets are moving. Everything is in order. How you can say that God is dead? What is your reason? No. God is not dead. God is alive, and you can meet also God because He is a person and you are a person. Just like here, if you try, you can meet the greatest personality of this material world, say, the president. It is not difficult. You have to simply arrange your meeting. Similarly, you can meet God face to face, just we are meeting here face to face. Simply you have to make arrangement. That's all. And this is the arrangement—Kṛṣṇa consciousness. If you make this arrangement complete, then you will see God face to face. Not only that, that you will see God face to face after this life. No. Even in this life also you will see God face to face. Premāñjana-cchurita. And what is that qualification? The qualification is love. Simply you are loving so many things. That is not giving you satisfaction. You try to develop your love which is already dormant in you, and when you are efficient in loving God, you will see God face to face. Premāñjana-cchurita-bhakti-vilocanena santaḥ sadaiva hṛdayeṣu vilokayanti (Bs. 5.38). The Brahma-saṁhitā says that those who have developed love of God and smeared the eyes with the ointment of love, but by that ointment the sight of your eyes, the material eyesight, will be clear. Just like you sometimes apply medicine on your eyes to see clear, similarly, there is a process to make your eyesight clear to see God. That's all. Not that stop seeing, but clear the eyesight. Purify your senses. That is called bhakti. Bhakti means the process of purifying the senses. That's all. And as soon as your senses are purified, transcendentalized, you see God face to face. Premāñjana-cchurita-bhakti-vilocanena santaḥ sadaiva (Bs. 5.38). Sadaiva means constantly, without any cessation, you can see God always, everywhere. Everywhere. Sthāvara jaṅgame dekhe, nā dekhe tāra mūrti. You will see tree, but you will not see the tree; you will see there Kṛṣṇa. You will see a bird, but you will see there Kṛṣṇa. That stage will come. Premāñ... When your loving spirit is developed fully like the full moon, then in the full moon night, as you can visualize the whole city, similarly, by raising yourself to the platform of loving service of Kṛṣṇa, you will see God face to face. Premāñjana-cchurita-bhakti-vilocanena santaḥ sadaiva hṛdayeṣu vilokayanti yaṁ śyāmasundaram (Bs. 5.38). That God is Śyāmasundara. This Kṛṣṇa is called Śyāmasundara. Śyāma means blackish, but He's very beautiful, very, very beautiful. Śyāmasundaram acintya-guṇa-svarūpaṁ. Acintya means inconceivable. 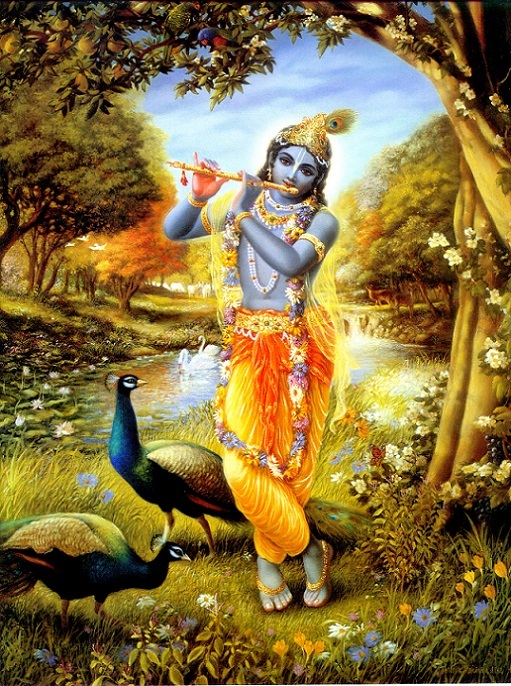 His qualities, His transcendental qualities, are inconceivable. When in the Vedic literature it is said that God is quality-less, nirguṇa, nirguṇa means He is transcendental to these material qualities. But His transcendental qualities are there. So He is called that acintya-guṇa-svarūpaṁ govindam. We just offer our prayers, three verses only from this Brahma-saṁhitā, before our this recitation of Śrīmad-Bhāgavatam. That Govinda is the original Personality of Godhead, and Śyāmasundara, with a flute in His hands, and He is very (sic:) pastimious, always smiling. And by His smiling He offers you blessings. You also, by seeing His smiling, you remain everlastingly smiling. It is so nice.